This is a life-size cardboard cutout of Olaf hugging the Snowgies from the Disney short film Frozen Fever, filled with all the magic of an Arendelle spring. 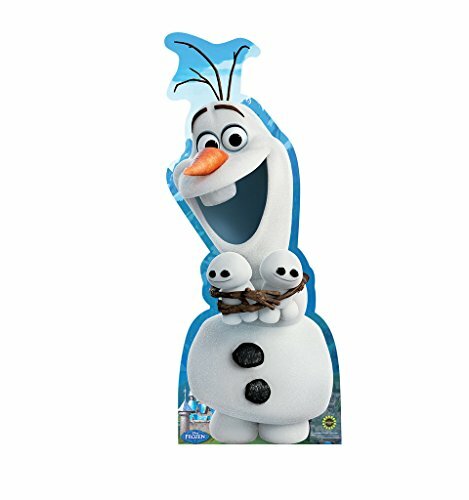 Bring a smile to the Frozen fanatic in your life by bringing home their favorite character today! Don't forget check out the other great Frozen products we have available too! Size is: 45" x 19". How to Set Up Your Standup: 1. Unfold standup and easel. Lay standup face down on a clean, flat surface. 2. Fold easel up along the long vertical crease that runs the length of the standup. 3. Lift upper and lower tab to lock easel in place. 4. Attach upper tab to top of easel. About Advanced Graphics: Since 1984, Advanced Graphics has been committed to producing the highest quality Cardboard Standups and Custom Prints in the world. We are the worldwide industry leader in the licensing and distribution of Cardboard Standups. We are also the #1 source for Licensed and Custom cardboard standups in the industry. Our goal is to provide the highest quality prints to our customers. We put our customers first and will continue to provide the best customer service to those who keep us in business. If you have any questions about this product by Advanced Graphics, contact us by completing and submitting the form below. If you are looking for a specif part number, please include it with your message.